Deep fry the crackers in vegetable oil heated to 180 Degree C - 200 Degree C. Once the crackers start to expand and float, remove from oil and drain well on kitchen paper. Serve immediately. Ingredients: Modified Corn Starch (60%), Tapioca Starch (20%), Water, Prawn Extract (Crustacean) (9%), Salt, Sugar, Flavour Enhancer (E621), Colours (E133, E110, E124, E102). 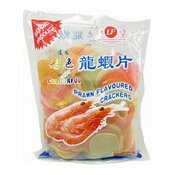 Simply enter your details below and we will send you an e-mail when “Colourful Prawn Crackers (彩色龍蝦片)” is back in stock!